William Hill Promo Code 2019: $50 Mobile Bonus on First Deposit! Register today at William Hill US using the William Hill Promo Code and take part in the Mobile Welcome Bonus, giving all Nevada-based users the chance to receive an extra $50 on their first deposit when they create a mobile betting account! To reveal the William Hill Promo Code click on the button below. Here's a list of advantages you can access to when registering with the dedicated William Hill Promo Code. Read T&Cs before placing your first bet. What are the William Hill Bonus Details? Are there other promotions on William Hill Sportsbook? What are the available betting markets on William Hill Sportsbook? Is there a William Hill Mobile App? What are the William Hill Payment Options? Is there a William Hill Customer Service? Go to the William Hill website. Complete the WH registration form. Make a qualifying deposit into your betting account from any of the William Hill outlets. The bonus will be credited to your account after you wager through the total deposit amount. Only users over the age of 21 within the State of Nevada may activate the bonus. A minimum deposit of $50 is required to activate the bonus. The William Hill Promo Code must be applied during registration. Not using the William Hill Promo Code will result in the forfeiture of the bonus. Users will receive 10% on their first deposit amount in bonus cash up to $50, once their initial deposit amount has been wagered through 1X. The bonus is only available for wagering via the William Hill Nevada Mobile App. The offer expires May 31, 2019. William Hill is constantly coming out with new promotions to incentive users. Promotions can be either seasonal or long-term. Users will then be given $1 for every 1000 Fall Rewards Points early next year. *General terms and conditions apply. Find out more on the official website. In-play betting options are available for all sports along with outright and pre-match betting. Parlay Cards are available daily for select matches. American Leagues such as the NBA, NFL. MLB and NHL are particularly well represented with betting markets, with special prop bets and out rights available for a number of games. Soccer fans will be happy to hear that all major leagues from around the world are available for betting including the English Premier League, Champions League, La Liga and the France Ligue 1. Where the sportsbook is lacking is the overall number of sports available. With only 10 sports in total available at the moment, users will not have the opportunity to bet on more niche sports from around the world. Coupons and price boosts are also not available at the moment. The sportsbook offers live streams for select sporting events as well as in-play betting opportunities on all of its sports. Live streaming is generally limited to larger sporting events such as special pay-per-view fights and large championships like the Football World Cup. To access the live streams users will be required to have funded account or a real money bet. Live betting is one of the key selling points of the sportsbook, which provides a full list of sporting events available for live betting daily. Live betting markets fluctuate second by second based on the current status of a sporting event. No cash out feature is available on live bets already placed. The William Hill Mobile is an award winning betting application, free to install on both iOS and Android devices. To use the WH Mobile App users will need to be using an iOS version 8.0 or later on their iPhone, iPad, and iPod touch. The Android version is available on any up to date mobile device. The mobile app comes with a number of useful features such as quick deposit, instant notifications, in-play betting and a ‘Promotions’ section. The interface is made in a very easy-to-use layout, allowing users to make quick bets and receive notifications whenever their bets are in play. 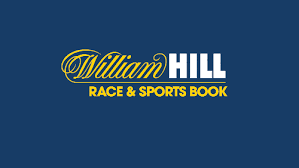 As mentioned before, the registration for a mobile betting account comes with the chance to take part in the Mobile Welcome Bonus with the use of the William Hill Promo Code. The Mobile Bonus enables new users to receive up to $50 in bonus cash upon first deposit and a 1X wagering run through. A number of different payment methods are available to fund your betting account. Most require users to deposit and withdraw money live in-person. Payments for Nevada customers can be made at the WH Sportsbooks and participating 7-eleven outlets. Alternatively payment can be made at any of the following four franchises: 7-Eleven, PT’S, Sierra Gold, Sean Patrick’s. Users will need to have a registered WH Betting Account before attempting to make a deposit. Photo ID will be required. The Mobile Welcome Bonus is available with any of the payment methods as long as the William Hill Promo Code has been used on registration. To fund your account at William Hill US a minimum deposit of $20 is required. None of the payment methods will be charged any fees on the sportsbooks end. The customer support team at the sportsbook is available via Live Chat, E-mail and Telephone. Live Chat is the recommended method of contact. The support team has a good reputation for being helpful and polite and should be considered the first option for any issues you may encounter on the site. Alternatively, a comprehensive FAQ section is available at the WH ‘Help’ section, giving users answers to many of the frequently asked questions. If you run into any issues using the William Hill Promo Code try the FAQ section first. As one of the major players in the world sports betting industry, much is expected of William Hill in the US. While the expansion of the sportsbook has just begun to leave the Nevada district into New Jersey and other states it is expected that the site will hit a nationwide audience in the very near future. What we like about William Hill? What we don’t like about William Hill? 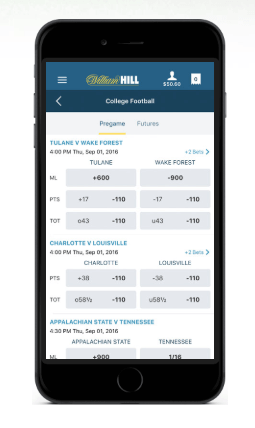 The platform still has ways to go to in terms of sports and betting markets on offer but have a promising start with one of the best mobile apps available in the US and live streaming and betting on all of their current sports. Payment methods are limited to in-person deposits and withdrawals in Nevada and a few online payment methods in New Jersey. Keep in mind that if your register in Nevada with the William Hill Promo code for a mobile betting account you can take part in the Welcome Bonus, worth up to $50 in free bonus money. Yes. There is William Hill Promo Code available for the Mobile Welcome Bonus. The William Hill Bonus can be claimed by anyone over the age of 21 who registers for a mobile betting account in the State of Nevada. Can I claim the bonus in addition to other bonus offers? The Mobile Bonus can be claimed in addition to other bonus offers if expressly described so. If you run into any issues claiming the bonus you may contact the William Hill Customer Support team via Live Chat or read through the FAQ section for clarifications.